People in default or foreclosure report the poorest health and are twice as likely as people not in foreclosure to experience illness. Additionally, people in foreclosure had a higher prevalence of serious psychological distress than any other group. Foreclosure & Health ~ Read more. I give foreclosures to the Angel of Divine Love. 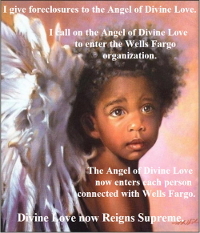 I call on the Angel of Divine Love to enter the Wells Fargo organization. 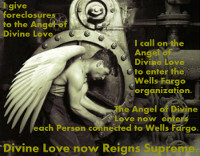 The Angel of Divine Love now comes alive in every person connected to Wells Fargo. Divine Love now Reigns Supreme. And, will you share this page? Your Nerves v. Foreclosure ~ Read more. Stress Can Break You ~ Read more. Suicide and Foreclosure ~ Read more. Wells Fargo is once again trying to foreclose my home. This scares me because Wells Fargo began this foreclosure without serving me. I was lucky to find it when I went to Case Lookup for dates relating to the foreclosure of my condo, which was done without a hearing although I had answered. Serving a party to a lawsuit is basic due process. It is a Constitutional right from the 5th Amendment to The United States Constitution. The 5th Amendment is a part of our Bill of Rights. Understanding Due Process ~ Read more. It is also basic due process to have a hearing if a defendant answers a complaint. If a court decides not to have a hearing the plaintiff rejoices that the defendant must accept the unjust loss that results. Throughout the United States, Wells Fargo and Bank of America use fraud, dishonesty and the denial of the basic constitutional right to due process to make American families homeless and gain control of their property. Sometime after I discovered the foreclosure, the HAMP – Home Affordable Modification Program – was introduced. I immediately applied. In time Wells Fargo qualified me and sent me an offer for a trial period. I accepted and sent in my payments on time and in full. This was supposed to ensure my loan modification becoming permanent. But, Wells Fargo went back on its word and began trying harder than ever to foreclose. Loan Modification Problems ~ Read more. Hamp Letters ~ Read more. Wells Fargo’s fraud, deceit and dishonesty scare me. It’s distressing to have the bank I trusted be dishonest. Stress is bad for nerves and health, and I already have a lot more pain. 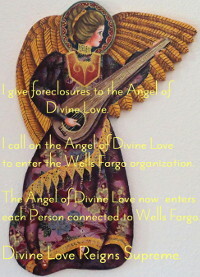 I am still in my home, years after Wells Fargo filed for Foreclosure because I did discovery and requested that Wells Fargo produce the Original Note, as per UCC requirements. Original Note Needed ~ Read more. I will keep fighting the foreclosure of my home because I love my garden. I can’t go places because I can’t walk very well, so my garden is the love of my life. I love the bees, wasps, praying mantis, lizard, ants, flowers, and veggies. I have the veggies in my meals every day, but most abundantly during the summer. I am sure that Wells Fargo would change and be good, rather than bad, if there were enough people holding that thought. 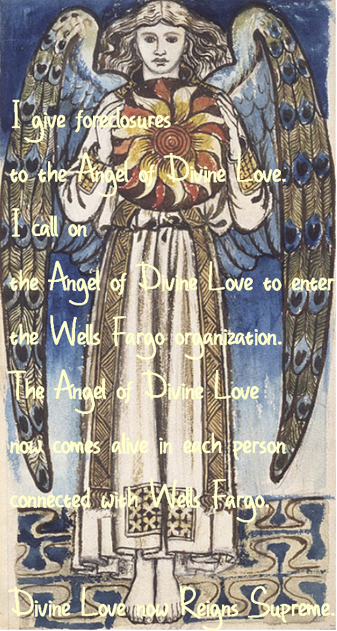 So, I’m calling on the Angel of Divine Love to spread awareness and bring Divine Love to Wells Fargo. Please help raise awareness of foreclosures to help all Americans who are up against powerful banks that get away with fraud and dishonesty.